Whenever the population increases, the need for new homes becomes a constant. Combine that with the need to replace or repair the old as it ages or as ownership changes, construction is a booming industry. What’s more, it will remain that way for quite some time. While the average expected rate of career growth over the next decade is 14%, a value tied to expected population growth, the overall health of the construction industry brings causes analysts to expect a whopping 23% increase in the size of the industry over the next decade. This makes the industry an excellent choice for those who want to ensure that their training will net a job in their future, as well as contain the scarcity of workers necessary to make advancement a breeze for those with the drive and the skills needed. The plasterer and stucco mason is just one facet of the construction industry. While not expected to grow as quickly as the rest of the industry, a mere 17% compared to the construction industry’s 23%, it is still above average when compared to the economy as a whole. Responsible for the covering of interior or exterior walls with a mixture that hardens to a stone-like consistency when exposed to the air for a period of time, the two roles differ primarily in what is being spread and where this spreading occurs. The plasterer is responsible for the installation of the final layers of interior walls. Plaster is not typically applied directly to the core structure of the wall, as this results in senseless mess should anyone ever have to get in there and fix something. Should the core structure be solid concrete, however, a plasterer gets right to work covering it. If this core structure is not something of that sort, a lath, or wire mesh, is installed directly over the core. At this point, the plasterer mixes the proper plaster for the job and applies two to three coats. Decorations, sealants, and the like are applied as the job warrants. Given this is a construction position, this cadence is very methodical and is followed for each and every task the plasterer performs. The stucco mason is responsible for the application of stucco to exterior walls. A concatenation of lime, sand, and concrete, stucco is cheap and rugged, while also particularly iconic in the American southwest. Much like plaster, it is applied to solid core structural materials on onto a wire mesh lath. 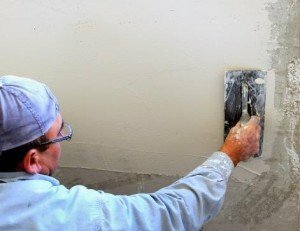 The same skills of mixing and multiple coat application are required, making plasterers and stucco masons fairly interchangeable should the need arise. As a workman role in the construction industry, neither the plasterer nor the stucco mason require a college degree at any point in their professional development. Instead, a high school diploma or GED is considered sufficient. For those who wish to have an edge over their fellow applicants, prospective plasterers and stucco masons can apply for three or four year apprenticeship programs. In these programs, 2,000 hours of compensated work experience is gained annually, while an additional 144 of instruction is also conferred upon the apprentice. As construction trades, plasterers and stucco masons can expect to do the same job on the first day of their careers that they do on the last day of their careers. As they progress, supervision will likely tend to decrease, while independence, the likelihood that somebody else is obligated to listen to their own orders, and pay will tend to increase. Decorative plaster work may be left for more experienced artisans in the field, though this is not a hard-and-fast rule.